Most of us have lived with forced air heating systems. These systems, utilizing natural gas, propane or fuel oil, heat air within the furnace as its blower forces the heated air throughout the house via ducts. Radiant heat, however, is a completely different, more efficient, method of heating a home. 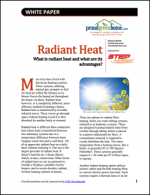 This white paper, sponsored by STEP Warmfloor®, explains what radiant heat is, why it's more efficient than traditional heating systems, and what products offer radiant heating for your home.